The differences between using patio pavers and installing stamped concrete. The safety features, cost, upkeep and usability of both options. The costs associated with both patio pavers and stamped concrete. With that in mind, you should want these outdoor additions to do many things such as hold up against Mother Nature, be maintenance friendly and look and feel as great as it did when you first put them in. With so many selections to literally help pave the way, let’s explore two types of concrete: Stamped Concrete and Patio Pavers. As two attractive and affordable outdoor options, we’ll discover how they stack up against each other in terms of aesthetic appeal, safety, upkeep and cost. 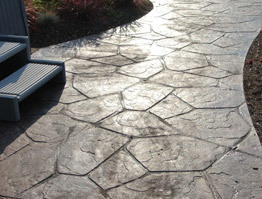 Because of its unique texture and variation, some would argue that stamped concrete is generally more ornate and typically ranks higher on the “wow” scale. It also has the exclusive ability to mimic other natural materials such as slate, flagstone or brick, giving it even more appeal. Others would fall into the paver party. They would sing pavers praises due to its unrivaled natural beauty and availability in a multitude of surface finishes, colors and shapes. Plus, paver stones provide design flexibility, which is unique to this option because you can personalize the pattern to best suit your needs. Since asking about the aesthetic beauty of these options is so subjective, let’s visit some of the other areas to unveil any differences. Taking into account the human element is just as important as any other factor when considering outdoor home improvement choices. Let’s start with stamped concrete. Because of its continuous slab feature, it has a tendency to be more slippery when wet and also produce more daytime glare, which could have some considerable drawbacks. If you live in an environment frequented with rain, for example, this might not be the best way to go (unless you safeguard it with some type of DIY protectant). Speaking of tripping hazards, pavers aren’t off the hook either. With the settling and possible heaving of this material, pavers can become uneven and cause someone to have a walking incident just as much, if not more, than stamped concrete. On a greener and safer note, because of the high level of joints in the surface, pavers aide in the drainage from rain and snow creating better skid resistance and decreasing glare providing safety as well as ecological benefits. In addition, they generally have lower heat absorption since they are normally laid over a concrete slab or RCA base with sand swept joints between them, which is a major bonus to the barefooted folks. After stamped concrete is installed, it normally doesn’t end there as far as care goes. Whether it’s within a few months or a few years, this product is guaranteed to get cracks. Factors like heavy loads, settlement and the fact that concrete tends to shrink over time play a huge role in this maintenance challenge. So before you crack up over after-care maintenance, you might want to consider a couple of ideas. Most people who use stamped concrete get a textured pattern to better hide hairline cracks. Also keep in mind that stamped concrete has a harder finish and therefore shows more wear and tear. With that, it can be more difficult to provide an exact match to the color and pattern of the original material each time a repair is needed. Pavers on the other hand are ready to go immediately after installation and tend to be much more forgiving than concrete and easier to fix. Why? They are individual units that interlock with each other providing a more giving environment with pressure, expansion and contraction. They are also molded under extreme pressure and are much stronger and durable. Thus, they will not crack. And they can even increase their structural capacity over time. Overall, they are better suited for extreme climate changes. If pavers ever do require maintenance, they are manufactured to be uniform and can easily be replaced with the same aesthetic quality as when new. It’s as simple as taking them out and resetting them, which can be an attractive quality for those into the DIY. Also, if pavers are properly installed with a good base, there shouldn’t be significant issues with setting or heaving. However, pavers do have their downsides. From time to time you may need to fill in the spaces that form between individual pavers with sand. This is an upkeep aspect that stamped pavement doesn’t have issues with. Upkeep and cost pretty much go hand in hand. So, it’s rather difficult to discuss one and not the other. And sometimes that can be the deciding factor in most purchase decisions. In general, most sources suggest that the upfront cost of stamped pavement tends to be a more inexpensive option in relation to pavers. Long-term cost efficiency between the two however is relative to factors including proper installation, climate and periodic maintenance. Thus, some would argue that it really pays in the end with pavers and others would say that stamped concrete is more cost efficient in the long run. Beautifying your outdoor space in an affordable and attractive way definitely requires some careful deliberation. When considering whether to go with stamped concrete or pavers, it’s important to keep the above mentioned factors in mind when stacking up your decision as both provide excellent choices that should last for a lifetime of enjoyment.